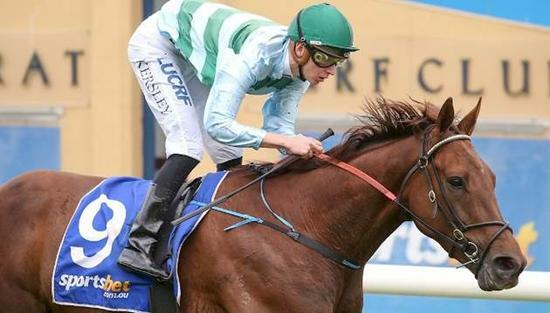 Patrick G Carey Racing Stables :: Khartoum back to his best! Khartoum back to his best! Khartoum returned to the winner's stall in commanding style on Saturday 24th November, winning the Champions Estate Handicap over 2300m thanks to a brilliant ride by jockey Fred Kersley. Fred rode the big son of Helenus patiently throughout, maintaining his spot on the fence before weaving his way through the field in the straight and stretching out for an eye catching win. This is the second winner in a week for Trevor Delroy and Wyadup Valley farms, breeder and owner of Khartoum. Trevor stood Khartoum's sire HELENUS until his untimely demise, and several of Trevor and Pat's Group and Listed winners including CEDARBERG, ETHIOPIA, ANGOLA and DURNFORD were by HELENUS. Interestingly Trevor's new stallion CROWDED HOUSE had his first win as a sire last week, with promising 3YO staying filly Alexandria winning at her first ever start. Congratulations and thank you to the team at home (Epsom Lodge) who do such a great job taking care or all of our horses.